Very nice image and I too like the light. Excellent! Wonderful contrast between Spring in the foreground and Winter in the bg. Great light too! V.
The directional lighting is really nice here. Well done. Excellent light, Alf. Very nice composition. 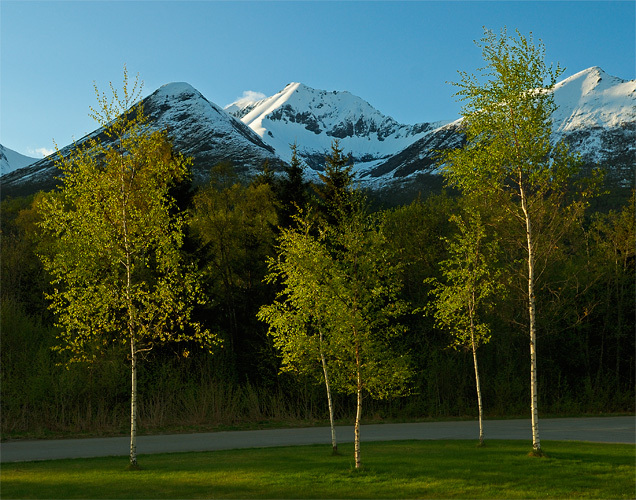 Beautifully composed mountain scene with superb spring light illuminating the foreground trees - very nicely done. Beautiful light. The young leaves of the birches are shining so brightly! Very pretty and clear moment. Beautiful composition with the young trees, lovely contrasting greens too.